Theater of the Oppressed (T.O.) provides tools for people to explore shared struggles, unpack their shared history and present situation, and then experiment with inventing a new future together. We use theatre and embodied physical practice to disrupt, transform, and design strategies to challenge internalized, interpersonal, and systemic oppression. Through gathering in public for an action or reflecting with our closest community members, comrades and colleagues, with T.O., we lift up invisibilized stories. PFCC’s Theater of the Oppressed Project is really multiple projects to support movement building and liberatory education for social justice. In contrast to our “fee for service” work, most of the projects described below are all offered by donation or free. All of our T.O. work is highly interactive and experiential. We accommodate physical limitations and health/access needs, with a warm invitation for everyone to move their body the way that their body moves. For more about TO, visit our Resource Page. Facilitators are skilled practitioners of Theatre of the Oppressed and other liberatory performance mediums. Contact us to start a conversation if you are interested in learning more. Here is a listing of our current offerings. Please contact us to learn about upcoming opportunities. Introduction to Theater of the Oppressed: Are you T.O.-curious? We offer 3 hour mini-playshops for people and groups who are considering partnering with us for more. Day-long Intensives: We invite you to dive into three traditions within the T.O. canon: body de-mechanization (embodied practice), Image Theatre, and Forum Theatre. You will experience them as generative, educational and strategic tools - with historical grounding in its origins of class analysis and class struggle, and for use in the current political moment. Joker Trainings: Training for Trainers, facilitators, or “difficult-ators” of T.O. You’ve experienced T.O. as a participant, attended playshops, perhaps even stepped up to lead a warm-up game every once in awhile. Now you’re ready to take things to the next level - come to hone your skills as a “Joker,” or Facilitator of T.O.! In a deck of cards, the jokers do not belong to any suit, and can serve as a wildcard by shifting rank against others. In Theatre of the Oppressed, the Joker moves in between the actors and audience to probe, challenge, and support collective insight. By complicating or problematizing the situation that’s being presented, the Joker holds the group and opens pathways to realize how and when change can happen. Theater of the Oppressed in the Classroom & After School: Training for classroom teachers, after school teachers, program leaders, educators, support staff, counselors, youth organizers and community members who work with young people. Participants will learn techniques and best practices for effective facilitation in high-trauma environments with youth. People of Color Playshop Series: Regular play/practice session for people who identify as POC. We consider our lives as workers, educators, artists, folks outside of Eurocentricism and dominance - or right in the middle of it, depending on how you see it. Come to learn tools for creative resistance, express yourself, flex your facilitation muscles, revel in the wisdom that our bodies hold. Expect to find community and laughter in this non-judgmental, politicized, kind, inclusive, joyful setting. Rainbow of Desire Training for Healers: Two-day learning laboratory for drama therapists and non-clinicians alike who are already familiar with improvisational and theatrical techniques for processing individual and family histories/emotions/ traumas. T.O. Playshop for White Folks: In partnership with the White Noise Collective, training participants explore internalized white privilege, white superiority, and white fragility as well as unpack common dilemmas in our work as racial justice allies and accomplices. Come ready to be simultaneously self-critical and self-loving/ serious and playful. Open Community Workshops: Dynamic, experiential sessions for learners at all levels. T.O. for you! We guide sessions in universities, high schools, after-school programs, non-profit organizations, public agencies, and other spaces around the San Francisco Bay Area. We tailor the content and curriculum to meet your needs, and negotiate the cost based on your budget. Get in touch to think through what might be possible! 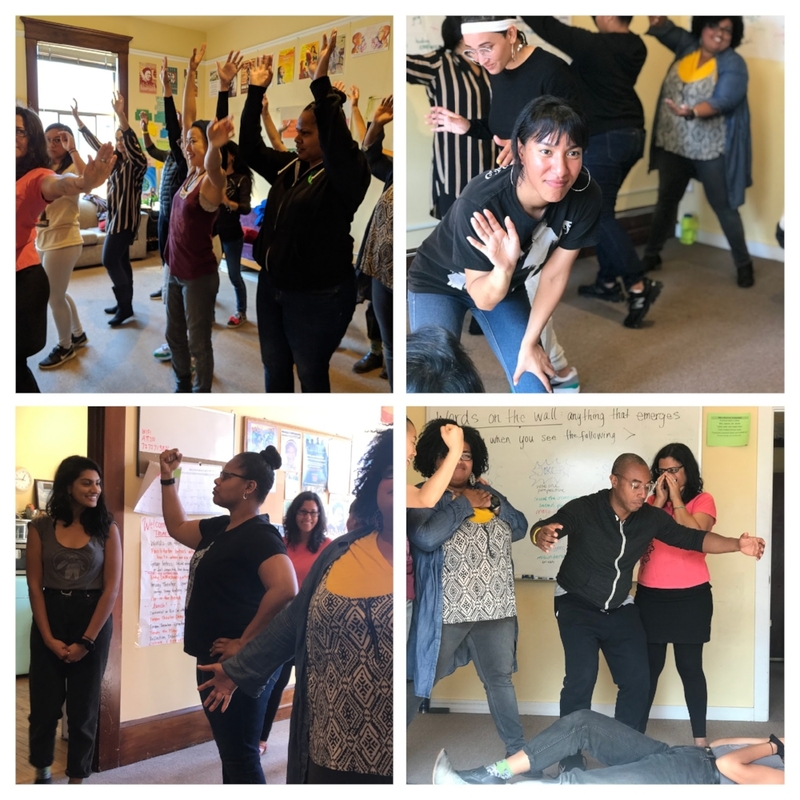 Bridging Restorative Justice and Liberation Arts: In partnership with the Oakland Unified School District, we host monthly sessions for teachers, RJ facilitators, school youth workers and other educators to deepen their skills in theater-based activities and facilitation. We explore dramatic play, embodiment, creative expression, and consider power in society. Both RJ and T.O. are modalities for healing, social and personal transformation, and leadership: we work at their intersection and bring overlapping core principles to life. Details here. Transforming Conflict, Healing Harm: applied theater arts training for formerly incarcerated people, victims/survivors of violence, people with incarcerated loved ones, and community members impacted by the criminal-legal system and trauma (historical, intergenerational, acute). People who intersect with these issues professionally are also welcome - RJ practitioners and circle-keepers, Case Managers, Counselors, Probation Officers, victims’ advocates, prisoners’ advocates, community organizers, peacebuilders. Dates and location TBA. Beyond Partition: Part of the United States of Asian America Festival of the API Cultural Center, this workshop is a space for healing, critical consciousness, and creative expression for members of the South Asian diaspora. We will address collective trauma from 1947 Partition, the largest human displacement in recorded history, and other fault lines and fractured memories of colonization, casteism, language politics, Islamaphobia, and intergenerational cross-currents of religious conflict. We will dive into the art of apology, physical storytelling, role and role reversal, and the sculpting of emotions. Our family of cultural workers, from past to present. We pull from this talented group to move our work forward, keep it relevant and responsive to the needs of our ever-changing world and the fight for freedom within it. Jamilah Bradshaw-­Dieng, Director of "We are Gathered Here Today" (Forum Theater play by the 2017 ACTual Troupe), is a social practice artist, grantmaker, and community health advocate from Oakland, California. She's most interested in using the aesthetics of the oppressed to express a pleasure politics that could advance health justice globally. Granddaughter of Louisiana and Texas migrants who have lived in Oakland since the 1950s, she is also a yoga teacher and certified massage therapist. Cat Brooks is an artivist and mother whose spent her life working on many social justice issues. She is the co-founder of the Anti Police-Terror Project, co-chair of ONYX Organizing Committee, an active member of the Black Lives Matter movement, and the interim director of the San Francisco Bay Area chapter of the National Lawyers Guild.At the age of 8, Brooks found her voice on the stage as an actress and in her journals as a writer. In her early 20s, she lived in Los Angeles working as an actress and communications professional. Since then, her life has been about impacting inequitable social dynamics through communications, organizing, advocacy, public speaking, and art. Tatiana Chaterji, PFCC's Theater of the Oppressed Program Director is a restorative justice practitioner, youth organizer, artist and educator. She uses liberation arts to heal and activate young people and community members, particularly relating to the criminal system, structural violence, and historical trauma. Tatiana draws inspiration from diverse protest traditions, and is a regular collaborator with political theater collectives in her creative/second home of Kolkata, West Bengal. Learn more about her work at www.tatianachaterji.com. Rosa González is the founder of Facilitating Power, a project designed to cultivate the practice & pedagogy of deep democracy. Rosa works with organizations, foundations, and collaborative initiatives to build the capacity for culturally rooted, community-driven leadership and to advance whole systems solutions to timely issues through fundamental shift towards the governance of community ownership. She wrote the Framework on Community-Driven Climate Resilience Planning Rosa has a Masters degree in Education from the University of San Francisco, and a Masters degree in Latin American Studies from Stanford University. Beshara Kehdi is multimedia artist, theatre of the oppressed flunky, and PhD student in Cultural Studies at the University of California, Davis. His work centers around Arab and Arab-American diasporas and social movement histories. He has a special interest in critical immigrant and refugee education, community organizing and leadership development, and decolonial critical and artistic pedagogies. He has worked in community youth empowerment and literacy programs and organizations for over 10 years, and is committed to supporting educators and youth-led movements for social and political change. Cecilia Cissell Lucas teaches classes at UC Berkeley on Art and Activism, Education and Social Change, Community Reparations and Decolonization, and Global Poverty, works with the Richmond Progressive Alliance, the Interfaith Committee in Solidarity with the Movement for Black Life, and POOR Magazine, plays drums in the street with the women/trans group BoomShake. Anna Maria Luera is a mother, partner, theatre artist and youth worker. Currently, she is a Dream Director with The Future Project at Downtown Continuation High School, working with young people to put their dreams and possibilities in action. Anna is one of the creators of the Rysing Womyn’s project, a theatre project that uses ritual theatre, poetry, storytelling and political education to tell stories of young women of color and she is a familia company member with Campo Santo Theatre. Anna's facilitated theatre workshops and worked with youth at all over the Bay Area with San Jose Repertory Red Ladder Program, Community Works, Each One Reach One, Lighthouse Charter School and Word for Word. Awele Makebe is the Theater Director at Skyline High School, an internationally renowned storyteller, and award-winning recording artist. She is also a circle-keeper and has trained with Theatre of the Oppressed founder Augusto Boal and leaders Julian Boal, Doug Patterson, and Jiwon Chung. She is also the visionary behind OUSD’s Dr. MLK Jr. Oratorical Festival. Heather Manchester is Program Manager for RJ in OUSD specializing in Student Engagement and Youth Leadership., she partners with young people and adults in meaningful dialogue towards equitable and more resilient communities. With deep roots in Oakland, she has also applied her skills in Theatre of the Oppressed as a tool to explore and transform conflict in Colombia, Northern Ireland, and Argentina. Alejandro Manzanarez is an Oakland-based activist who has used Theatre of the Oppressed to confront militarism at the border, racial profiling, police brutality, and predatory military recruitment practices. He has served as a youth leader in BAY-Peace: Better Alternatives for Youth, 67 Sueños, and All City Council, and was instrumental in shaping the Oakland Listening Sessions to build a people’s platform of public safety through the 2014 city council elections. He has supported youth to develop their public speaking skills and their analysis of the social issues that affect them. He is a graduate of MetWest high school and a former student at San Francisco State. Antoine Moore has a passion for individual, group, and community healing, having done various forms of human development or capacity building for 20 years. He is the Founder and Principal Consultant of Catalyst for Growth, a coaching, training, and consulting practice committed to helping individuals, groups, and organizations put their talents and strengths to best use. He sees his life’s work as creating innovative spaces and discovering more refined and sophisticated ways to help the human (and non-human) family to grow and thrive at scale. Yanina Rivera is currently the Drop In Center Coordinator at MISSSEY, Inc. She graduated with a degree in Interdisciplinary Studies and Critical Psychology from the California Institute of Integral Studies. Her previous work experience includes dance and production management, community arts practice (artist facilitator), community organizing with the Latin@ community in Arizona, outreach and events coordination, and using creative movement as a therapeutic tool to address behavioral challenges in youth and support children with developmental disabilities. Her passions lie within art, activism, and providing mental health/emotional support to those who may not find it accessible. Levana Saxon, Co-Director of Partners for Collaborative Change, develops strategic methodology, curriculum, training and research projects to support movement building and popular education. After working with the Paulo Freire Institute in São Paulo, she dedicated herself to making the theories and practices of Popular Education and Theatre of the Oppressed accessible to organizers, educators, researchers, and designers in the US. She's been facilitating Theatre of the Oppressed for 20 years. Aryeh Shell is the Director of Education and Training for Creative Action Institute, leading arts-based capacity building training for grassroots organizations throughout Africa, Central America and the US. She is the founder of the Herstories Project, a feminist oral history theater project. She has M.A.s in Education and International Relations, and carries two decades of experience in cultural activism and popular education. S. Leigh Thompson is a white and mixed-race trans queer person with disability and has spent the last 20 years working at the intersections of art and social justice and equity, utilizing Theatre of the Oppressed (TO) techniques and working with and for queer and trans* communities, youth, immigrants and communities of color. He has experience as an organizer, advocate, lobbyist and campaign strategist at a number organizations, including the ACLU, GLSEN, Race Forward/Colorlines.com and The Forum Project and is and is the President of Pedagogy and Theatre of the Oppressed. Alexa Zapanta is a grassroots agitator and organizer with Anakbayan East Bay, building people power in the struggle for national and social liberation in the Philippines. Born and grown in Vallejo and Richmond, California by working class migrants, her mission in life is to bring playful joy, laughter, and connection to peoples organizing for third world liberation. Alexa was first introduced to Theater of the Oppressed by a Marxist educator who imparted its important historical roots in serving the oppressed and exploited, not the "mildly inconvenienced". She continues this tradition as a cultural worker, language interpreter, and aspiring literacy educator wherever she is planted. Zara Zimbardo, PFCC Special Projects Director is an interdisciplinary studies faculty in two BA completion programs, with a focus on critical media, anti-oppression and postcolonial studies, and co-founder of the the White Noise Collective. For the last twenty years she has been a body-based therapist in private practice and community health centers. She is a writer and presenter on the social construction of whiteness, Islamophobia, subversion of stereotypes in a time of war, social justice comedy, and the zombie apocalypse.